The Macchi M.15 was an Italian reconnaissance, bomber, and trainer designed and built by Macchi. 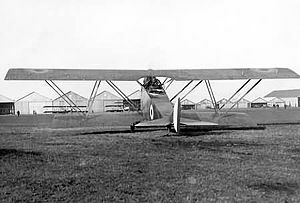 The M.15, which first flew in 1922, was a two-seat biplane with wings of unequal span, its upper wing being of wider span than its lower wing. Its interplane struts were inclined in a "V" configuration. Its 238-kilowatt (320-horsepower) Fiat A.12 engine drove a two-bladed propeller in a tractor configuration and gave it a top speed of 185 kilometers per hour (115 miles per hour). It had fixed landing gear. Macchi M.15 Pictures and Macchi M.15 for Sale.